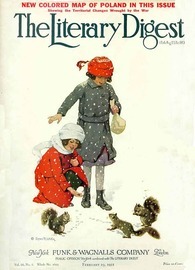 The Literary Digest was an influential general interest weekly magazine published by Funk & Wagnalls. Founded by Isaac Kaufmann Funk in 1890, it eventually merged with two similar weekly magazines, Public Opinion and Current Opinion. Beginning with early issues, the emphasis was on opinion articles and an analysis of news events. Established as a weekly newsmagazine, it offered condensations of articles from American, Canadian and European publications. Type-only covers gave way to illustrated covers during the early 1900s. After Isaac Funk's death in 1912, Robert Joseph Cuddihy became the editor. In the 1920s, the covers carried full-color reproductions of famous paintings. By 1927, The Literary Digest climbed to a circulation of over one million. Covers of the final issues displayed various photographic and photo-montage techniques. In 1938, it merged with the Review of Reviews, only to fail soon after. Its subscriber list was bought by Time.